Pcheneg Tremolo is a tremolo effect with the possibility to adjust the modulating curve shape and a host synchronized frequency. In the regime of the synchronizing with a host (Tempro sync), frequency is adjusted by the knob Note and note part switch (under the knob), which set a note frequency with respect to the host frequency. In a manual regime (Tempo man) this knob changes to the knob Freq, where the frequency is pointed in Hz. By the knobs Shape, Phase and Symm, one can set the form of the tremolo modulating curve. The knob Depth sets a degree for the modulation. 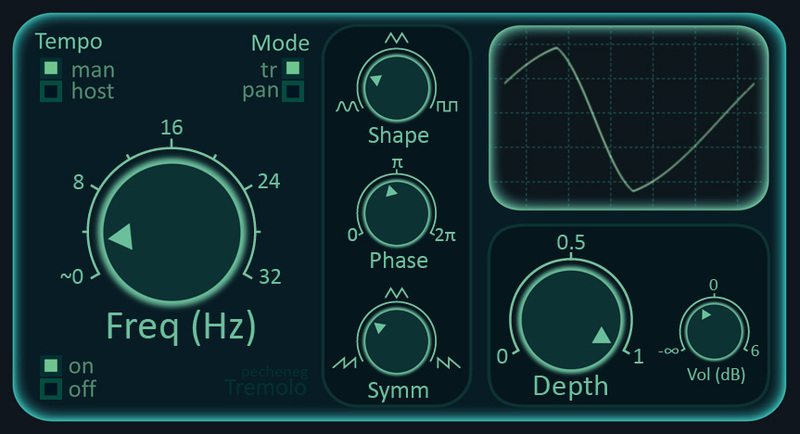 The Pecheneg VST plugin is a tremolo effect, which has the possibility to adjust the shape of the tremolo modulating curve and to synchronize the frequency with a host, or set it manually. When synchronizing with a host (Tempo: host), the tremolo frequency is adjusted by the knob, which sets the modulation period, while the note type (regular, dotted or triplet) can be selected below the knob. When set manually (Tempo: man), the tremolo frequency (in Hz) can be set directly with the knob. The Shape, Phase and Symm knobs set the wave form of the modulation, with the amount of modulation set by the Depth knob.